An interview with american ice dancer Richard Dalley, a 7-time US medalist, 1984 Olympian, ISU judge, and 2010 Olympic Team Leader. 48 minutes, 17 seconds. On his most embarrassing skating moment: Probably the one that stays with me the most is when we were doing the 1979 world championships in Vienna. And in the last 30 seconds or so of the free dance, I fell. I was humiliated, so I got on the train system there to get away from everyone. The train I was on took me a few hours away, and then it stopped and wasn’t going to return until eight o’clock in the morning. It cost me a few hundred dollars in a taxi to get back. On how he started skating with Carol Fox as roller skaters: We both skated in the same rink and took from the same coach, and when he left the Detroit area, he took a number of his skaters who he thought had some talent, and suggested they try ice skating. And we did, and the rest is more or less history. We were 15 and 16 when we switched. We thought we would have a chance as singles but we didn’t have a chance [laughs]. Carol and I both did all the disciplines in roller skating. It was funny, when we switched, the judges and the ice skating people all thought we looked good because we had pretty good posture and they understood what we were trying to do. But it was very hard to control the blades. On roller skates you have to work it a lot more to do edges. So you’re always skidding and doing unintentional three-turns when you switch from rollers to ice. On being coached by Ron Ludington: He was a roller skater, too. He’s in the [roller skating] hall of fame. I think he’s the first person to have landed a double axel in roller skates. Our first coach was our roller coach, and then we worked with Sandy Hess. She deserves the credit for having created Fox and Dalley. We went from, you know, fresh roller skaters to being on the world team with Sandy. And when we missed the Olympic team in 1980, we’d been around a while, and were in our 20s by then, and we said, if we want to keep on we have to do something different. We went to Luddy and it was probably one of the best things we could have done. Luddy’s fantastic, but more than anything else it was being on our own and in a highly competitive environment. With Sandy we were the team in the Detroit area, and when we went to Luddy I think he had 15 teams at the time. With Sandy, we were with her every day, and we knew if she wasn’t with us she was watching us out of the corner of her eye. And when we showed up with Luddy he promised us 20 minutes a week. It ended up being more than that as time went on, but that’s what was promised. And I think at the time we were ninth in the world, and he told us we weren’t allowed to leave the rink for four months. We didn’t do any choreography or shows or exhibitions for four months — we just stayed in the rink and stroked. We weren’t allowed to skate together for the first couple of months, we just stroked. His contention, and it was true, was that we came up so quick from the roller skating world that we never really learned how to skate by ourselves. We were dependent on holding each other up. And he wanted us to become good individual skaters. On training with their direct competitors Suzanne Semanick and Scott Gregory: It’s funny with the media and all about competitors, but we all considered ourselves the best of friends. Scott Gregory is still a friend, he’s a great guy. And at the time we moved, we didn’t consider them our competition [laughs]. They hadn’t made the world team and we had been to a few worlds. But they caught up pretty quick. On ice dancing being added as an Olympic sport: We started ice dancing around 1972, and we were at the 1976 nationals, the first year that ice dancing was in the Olympics, and it was a very exciting time. In our time it seemed it was likely to become an Olympic sport, and Jim [Sladky] and Judy [Schwomeyer] were working on it from 1972. And I guess it was sometime in that post-1976 era, when it actually was an Olympic sport, that I started to envision that I could be an Olympian. When you start at 16 you don’t really know what you’re going to do with the sport, but by the time it became an Olympic sport we could see that as a possibility. On being taller than usual for competitive skaters: Back then, ice dancing was considered the long, lean, beautiful-type sport, so I think it was a help. The ones that were the stars of the day, in my mind, were [Irina] Moiseeva and [Andrei] Minenkov, and they were probably the tallest ice dancers at the time. But today girls have to be pretzels and do all sorts of things, so I’m not sure that the tall is an advantage like it would have been in our time. On his first world championships, in 1978: It was fantastic. And it was [Jayne] Torvill and [Christopher] Dean’s first worlds too. They actually mention that in their book, that we were their competition in those days, and when they knocked us off, that was a sign that they were on their way [laughs]. It’s a very nice thing of them to say, but they were really in a class of their own. On moving up in the ice dance standings: We were fresh and new and exciting, and we went up very quickly. 1977, 1978, 1979, it seemed like everything was going our way, until that embarrassing worlds in 1979 [laughs]. And then Mike [Seibert] and Judy [Blumberg] showed up and were the new kids on the block and excited everybody, and we didn’t make the 1980 Olympic team. It was sort of like, we were the class of 1980 with Charlie Tickner and Linda Fratianne. Those were the people we grew up with. On not making the 1980 Olympic team: I can’t believe I’m saying this, but it really was a blessing in disguise. Who knows what my life would have been, but it would have been entirely different if we had made that Olympic team. I was 23, which was a nice time to do your Olympic experience, and then we probably would have gone and done Ice Capades for several years. But we didn’t do all that, because we didn’t make the team. And it changed things. We went to Luddy and learned a whole new dimension of the world of figure skating, and contacts, and people and things. My life is great, but it would have been very different if we made the team. But yes, it was devastating. I don’t know if you remember a skater, Becky Baker, but we were very good friends. And when I didn’t make the Olympic team I went to Alabama [and stayed with her] for a couple of weeks. I didn’t know if I was going to skate any more. It stopped, basically. And it was Mr. Baker, who after a couple of weeks of me lolling around there, said, what do you want to do with your life? And I said, go to the Olympics. And he said, well, maybe then you should get in the car and go to Carol and try to make the Olympic team. So I got in the car and went to Carol, and said, let’s skate. On how strong US ice skating was in that era: On the 1984 Olympic team we had three in every discipline, and we had two in the top five in every discipline, and three in the top ten in every discipline. So that was quite a team. And I would say that was the sort of the first time that the US earned its elite stripes in ice dancing. It had always been a Russian sport, but we were right there. I hesitate to say, though, that it was the golden era, because I think people tend to get nostalgic about skating and about ice dance in particular. I think the kids today are so much better than we were. They’re just a whole other level. We were pretty basic compared to what they do today. On the experience of the 1984 Olympics: It was everything I dreamt it would be. When you’re in the top five in the world, you like to believe you’re within striking distance of being on the podium, but being realistic, in ice dancing, fifth was the best we could have hoped for. So we met our dream in that regard, but just being there — I’m just one of those classic Olympic athletes, that just making the team was the goal, and then enjoying everything and being in the village. I did everything, I went to all the hockey, I went skiing, and I just enjoyed myself. It was great. And I really think that’s part of the reason we ended up fifth there and then eighth at the worlds a month later. I enjoyed it, took it all in, and that was it. [And competing against Torvill and Dean] you knew you were part of something special. We grew up when ice dancing didn’t get the same attention that the other disciplines of skating did, and Torvill and Dean brought all of the attention to ice dancing. It was funny, too, in Sarajevo they didn’t have any snow there, and all the skiing events were delayed. So they showed [on TV] every single bit of ice dancing [laughs] and people back home let us know that ice dancing was sort of the featured thing of those Olympics. But Torvill and Dean, we entered the scene with them, they were good friends. I remember in Copenhagen [at the 1982] world championships, they did Mack and Mabel there, and we followed them, and it took a good ten minutes to clean the ice. Chris was always apologizing [laughs]. You knew you weren’t going to beat them, so it was just fun to enjoy the ride with them, ride the wave of ice dancing with them. I use their Paso Doble [compulsory dance] now when I go in to talk to skaters. People skate it like they’ve seen it skated in test sessions, but Chris and Jayne just filled up the whole rink with that dance. 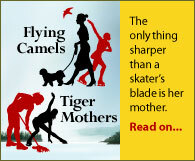 Their blades were so clean, they were just taking it to another level. But people who don’t grow up with them don’t know how good they were. They were exceptional. On his mustache: All the time when we were skating, Carol supposedly looked mature and I looked younger than I was. So in the Olympic year, Luddy said, this is probably the time to beef you up to look a little older. So it was his idea. On their Greek free dance: Bernie Ford and Diane Towler skated to [the music], and back then, that was like Bolero, you didn’t skate to it because that was like their trademark. So Bernie used to teach some of Luddy’s camps in Lake Placid, and we told him we wanted to skate to it, and he said, it’s about time. So he helped us with a bit of it. I call it the Zorba number. On professional skating: I loved professional skating and the whole world of professional skating. It’s like a catharsis. You shed that whole burden and just be yourself. It seemed that oftentimes [in amateur competition] we were the crowd favorites, so the professional world just lent itself to that. The crowds liked us, and that gives you great satisfaction. Plus you get paid for something I liked to do [laughs]. On the elimination of the Original Set Pattern in amateur competition: This is where the conversation gets interesting [laughs]. I think that ice dancing has evolved pretty darn good, and moving away from the OSP into what we do today has been a healthy and natural evolution. The problem is that right now the original dance and the free dance are too much the same, the required elements are too much the same. So it will be interesting to see what the ISU does with this combined dance and see if it brings some more dance moves into an original creation. On his involvement with sports administration: On the [US] Olympic Committee, I was the athlete representative on and off for years. And in one of my more interesting moments I was on the ethics committee when skating was going through a lot of transitions, after the Salt Lake City business was happening. It was a busy ethics committee [laughs]. And with US Figure Skating I was chair of the athletes’ committee. Back in those days we had a very small executive, so by virtue of being chair of the athletes’ committee I was also on the executive committee, which pretty much ran the day to day operations of US figure skating, so that was a pretty big deal. And I was the chair of the nominating committee when World Figure Skating and all that happened. Probably my most exciting year was when I was the paid chair of the US Figure Skating Championships in 1994 when the Nancy Kerrigan and Tonya Harding incident happened. It was pretty exciting, dealing with the mayor’s office and the police department and the FBI. It was pretty funny, as the athletes’ representative on the Olympic committee, I was technically Tonya’s representative [for athletes qualifying for the 1994 Olympics], and I was defending her right to participate while I was talking with the FBI about them bugging her house and so forth. But I did remove myself as much as possible, and the guy who was coming in as the athletes’ representative, I tried to direct everything to him. I feel that all this is my way of giving back. I have two businesses that I run at home and two kids that are teenagers, and I feel like my first responsibility is keeping my home life in order, but if there’s anything I can do to help the world of figure skating that gave so much to me, I will. But I can tell you right now I’m feeling a little overwhelmed with life [laughs]. On his view, as a technical specialist, of the new judging system: There’s no doubt it works. People can be critical of it, but it works. It’s probably more difficult to fit to ice dancing than to the other disciplines, but at the end of the day it works. And I love that the points will keep the groupings close and separate the ones that aren’t close. And when you go to monitor the skaters, they have their protocols there and they’ve gone through them because they want to get the points. Personally, I think it may have gone to an extreme because it’s too much about the points. The biggest attribute is also the biggest problem with the system, that it’s losing the simple beauty of our sport, because everything is going for the points. Too many skaters will try to impress you with some feat of greatness instead of doing something beautiful. On being team leader at the 2010 Olympics: It appears that the US Olympic Committee would like to have a paid professional staff member of each sport. So Mitch Moyer is our point person, and then Lori Parker and I are more of the traditional team leaders. So we’ll be in the arena interacting with the athletes and interfacing with the figure skating community. In the past, supposedly, team leaders would be distracted during the Games with so many other things going on, parents can’t stay in the village so they’re always trying to meet their kids, you’re trying to get tickets for other events, and so on, so you end up being a social manager rather than a skating team leader. On owning a golf course: I married my lovely wife, Shelley, who is an only child, and her father owned the golf course. He bought it in 1957. So he had died in 1997, and I inherited it. He was also one of the creators of putting logos on golf balls. So Shelley runs the golf ball logo business, called Tee Time, and I run the golf course. She has her thing and I have my thing, but as you can imagine we work on both businesses. And we have a golden retriever, Goldie, and she rides in the golf cart and keeps the Canadian geese off the course. 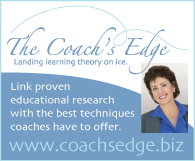 On US ice dancing over the past 25 years: When I was with the Olympic committee, the one thing that impressed me from watching all the events over all the years is that coaching is the most single component of success. And then the second one would be money. You notice whenever a host country has an Olympics, they bump up the money going into their program, and the host country always does better than they normally would. So over the last 25 years I think the ice dance program has done incredibly well, more than anything else because of the influx of strong Russian coaches. They’ve driven the strong American coaches to do better, and they’ve also broken some of our old paradigms of what ice dancing is — that it’s just dancing, whereas back in our day it was the technique of footwork and so forth. We have incredible depth now, and if we could just get more money it would shore up our ongoing success. What scares me, and I hope I’m wrong, is that from the 1994 nationals on, parents had this carrot, that the ice dancing world was a wonderful world to get your kids involved in. You had Stars on Ice and Champions on Ice, or you could go do Holiday on Ice in Europe, or Ice Capades, or Disney on Ice, or cruise ships. There was a multitude of activities and it was the charmed sport of the Olympic movement, and rinks were popping up everywhere. And in the last five years or so, with the economic downturn, the closing of Champions on Ice and the cutting back of the tours, parents are looking at this money for the kids having coaching 24/7, and saying, where’s the payback? I just think that a lot of parents and skaters themselves pay their own way. And the kids that were paying with money from appearances and so on, the money’s not there now. They just can’t keep going. So I think there’s a potential for a downturn. It’s been a good 25-year period but I am concerned that we could be at the beginning of a downturn. On his skating now: When I quit, I pretty much quit. Carol wanted to do a last event, and I had promised her, so we did the World Professional Championships but my heart wasn’t in it. And after that we did a show in Andorra, and I took my wife with me, we weren’t married then but we were engaged. And that New Year’s Eve of 1989 was the last time I skated with Carol. I promised Shelley, my life with Carol ends on New Year’s Eve and my life with you starts on New Year’s Day. So it did, on New Year’s Day 1990. My daughter started skating maybe 6 or 7 years ago, and I put the skates on to get her into the rink, and I skated a few months with her then to get her started. But that’s been it.